With Mesa 7.9 just around the corner and it sporting a new GLSL compiler, support for new OpenGL extensions, and months worth of other changes to core Mesa and its drivers, we decided to run some benchmarks of the latest Intel Arrandale graphics processor with the past few Mesa releases to see how the performance compares. We also have ATI and Nouveau Mesa benchmarks on the way. While there is the Intel i965 Gallium3D driver, it has not developed or supported by Mesa but rather a side project by a few VMware developers working on the Gallium3D architecture. The i965g driver is not official nor does it even really do much at this point, so, all of the testing in this article is being done using Intel's official classic Mesa DRI driver. The Intel OpenGL testing was done with the Mesa 7.7.1, 7.8.3, and 7.9-devel (obtained from Git on 2010-09-05). You can also find our Intel i945 Mesa 7.9 benchmarks with results that go back to Mesa 7.4. The system was an ASRock Core 100HT NetTop with an Intel Core i3 330M 2.13GHz CPU, an ASRock HM55-HT motherboard, Intel Core graphics, 4GB of system memory, a 500GB Seagate ST9500325AS SATA HDD. On the software side was Ubuntu 10.10 with the Linux 2.6.36 kernel (a development snapshot from 2010-09-05; 2.6.36-rc3), X.Org Server 1.9.0, xf86-video-intel 2.12.0, GCC 4.4.5, an EXT4 file-system, and then the three versions of Mesa we built from source. Tests ran with the three Mesa releases on the fifth-generation Intel graphics processor embedded on the Core i3 CPU included OpenArena, Warsow, World of Padman, Smokin Guns, and Urban Terror. As we easily do with the Phoronix Test Suite, each game was run at a variety of resolutions. 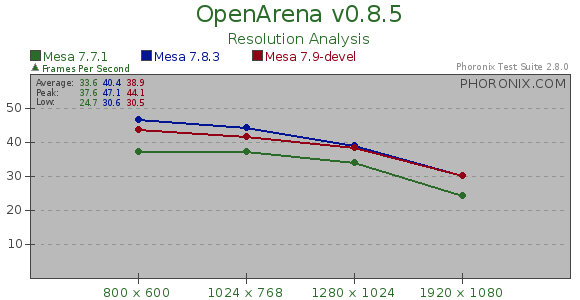 Starting with OpenArena we see that introduced between Mesa 7.7 and 7.8 were some very significant OpenGL performance improvements for the Intel Core graphics. This will be visible to users upgrading from Ubuntu 10.04 to Ubuntu 10.10 and other distribution upgrades around the same time. Between Mesa 7.8 and 7.9 we see the performance largely the same at 1280 x 1024 and 1920 x 1080 for this ioquake3-powered game, but at the low resolutions, the newer Mesa release was actually trailing behind potentially due to some new regressions. 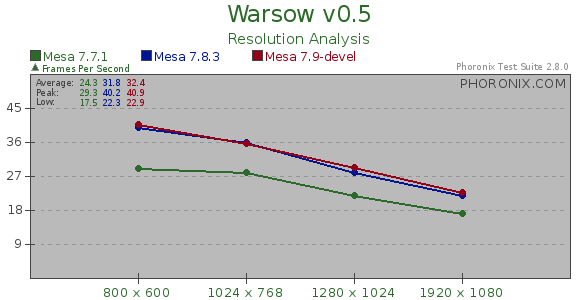 With the Qfusion-powered Warsow there again was a measurable boost witnessed between Mesa 7.7 and 7.8, but between 7.8 and the 7.9 snapshot we tested the performance was about the same. Sign up for the latest pass4sure 70-686 dumps and study materials for passing the 70-652 exam with incredible success. Also get high quality NS0-153 practice questions for exam prep.